Make sure your crutches are the right height – your elbows should be slightly bent when the crutches are by your side. When walking, put your crutches forward first, then your injured leg and then your uninjured leg. When going up stairs, put your uninjured leg on the step and then follow with the crutches and your injured leg. When coming down the stairs, put your crutches and your injured leg down on the step first, then follow with your uninjured leg. Feel for the back of your chair on the backs of your legs. Take the crutches out from under your arms, using the hand pieces of the crutches to steady yourself with one hand. Reach back to the chair with your other hand. Place your injured leg forward to prevent putting weight on it. Place both crutches in one hand slightly forward of yourself. Push down on the chair with your other hand. Once you are standing, place both your hands in the crutches. Please return the crutches to the clinic or service you got them from. If you paid a bond, this will be refunded. In this short video, a physiotherapist shows how to use crutches if you can't put any weight at all on your injured leg, and then if you can put some weight on it. 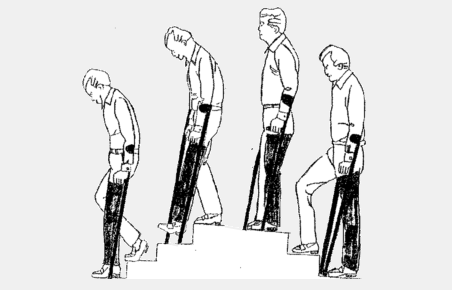 In this short video, a physiotherapist shows how to go up and down stairs using crutches, both when you can put some weight on your leg and when you can't put any weight on your leg. Written by Orthopaedic Outpatients Department and Physiotherapy Department, Christchurch Hospital. Adapted by HealthInfo clinical advisers. Last reviewed October 2017.